I first found a version of this tomatillo salsa with my sister, Calli, digging through Bobby Flay recipes a few years back. We made it that week for a big get together and it was an instant hit. I probably make some version of this sauce once a month. I call it a salsa, you can call it a sauce if you like. I always end up making extra because people take so much; for me it really becomes a side dish. No matter what you call it, the flavors are unusual and bold. Tomatillos look like tough, green tomatoes. They have a similar composition of skin on the outside, seeds on the inside. They come wrapped in a waxy, leafy exterior that needs to be removed before you cook with them. They have a naturally acidic flavors and balance out really nicely with other Mexican peppers. This dinner comes together very quickly and is a great meal to mix into your weeknight menus. Preheat the broiler to a high setting. Make the sauce by cutting the tomatillos and tomatoes in half. Cut the serrano and jalapeno in half as well, removing the seeds, stem, and rib with a paring knife. Lay all of the vegetables on a cookie sheet. Drizzle with olive oil and season with salt and pepper. Toss to coat and spread into one, even layer. Broil the vegetables on the third highest rack in the oven for 8 minutes per side, or until everything has a night, dark brown char. Remove the vegetables from the oven and let them sit until they are cool enough to touch. Scrape the blackened bits off the jalapeno and serrano with the back of a knife. Put the peppers, tomatoes, and tomatillos into a blender with the remaining sauce ingredients. Pulse until blended to your desired consistency. I prefer mine to be more of a chunky salsa than a sauce. Season to taste with salt and pepper. Put in a bowl and keep warm. With the broiler still on, one side of each of the tortillas. Place on a cookie sheet and bake until they are crunchy and a nice light brown. Set aside. Prepare the fish by seasoning both sides with salt and pepper. Season the top side with the garlic powder, onion powder, cumin, and paprika. Heat a large saute pan on medium-high heat. Put 1 tbs olive oil and a small pat of butter into the pan and let it get warm. Cook the fish for 3 minutes on medium-high heat. Flip the fish and reduce the heat to medium; cook another 4 minutes. The fish should be opaque and starting to flake on the outsides when it is finished. 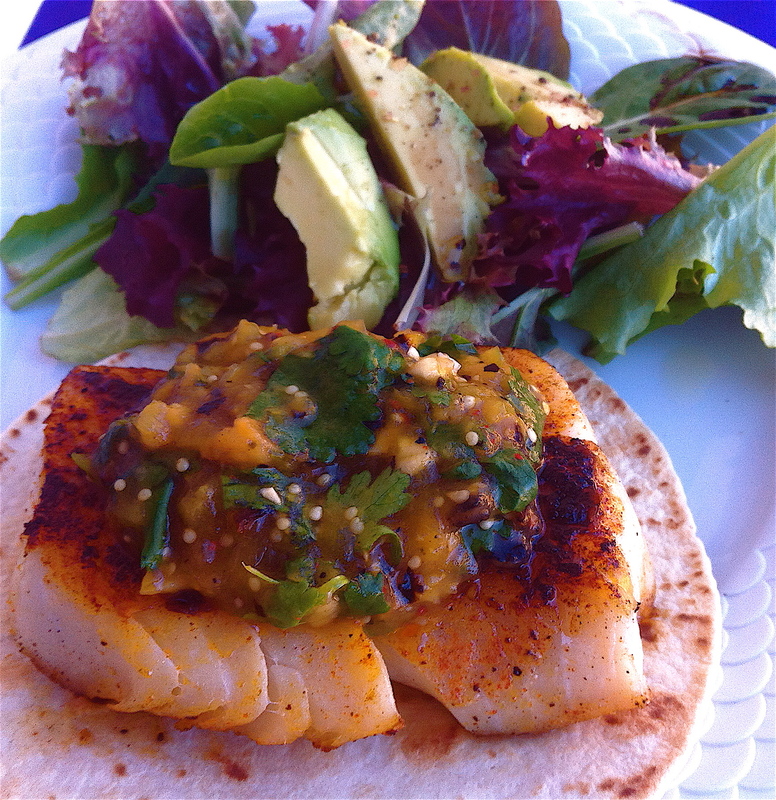 Serve the fish fillets on top of one tortilla. Top with lots and lots of sauce 🙂 .